When it comes to extensions to your property, one of the biggest current trends is bringing the outside in. With the ever need to entertain in an open planned area, and the never ending craving for light accomodation, British property struggles to deliver with such unpredicatble whether and often cramped accomodation. So what can you do to help lighten an extension and provide the light sunny feel even if it is too cold to bask in the sun on the patio? With options such as Glass walls and Bi-folding doors, you will need a large proportion of glass specifically looking out onto the garden or patio. This will give the illusion of the room not ending but extending into the open space. This will not only provide a contemporary feel but provide a bigger and brighter space. 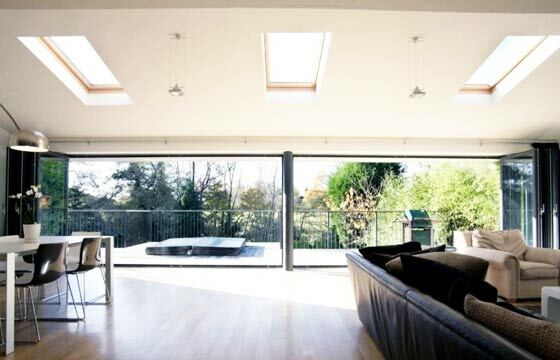 If you are planning on a flatroof then consider having a Roof Lantern or orangery. This will not only increase the light deep into the room, but provide a brighter outside ambience indoors even on a cloudy day. Flooring can make a large difference the effect. Before you choose your floor think about the effect of going beyond the inside. Choosing a tile or wooden flooring that can run from the inside of your home right outdoors will also help merge spaces through the folding doors providing a seamless transition form inside to out. Avoid different levels from inside to out. If you have to step up or down to get in and out, you will undo the very effect your trying to acheive. If you can get permission, try extending the roof out into the garden. Not only will this help merge the outside in, but when it’s raining you will still be able to have the bi-folding doors open without the risk of rain coming in. Even with the most beautiful glass walls and doors, if you start cluttering the space with various ornaments and funriture you’ll sooon loose the effect. Ideally a few green indoor plants on the edges of the wall will help blend the garden with the inside without blocking too much light. Keep the rest of the area as clutter free as possbile. If you have furniture outside that match the furniture inside this will also add to the illusion of a room that extends into the garden. In fact any linking of colours shrubs or furniture are all quick tricks to help provide this illusion. If you are buying furniture for indoors, then a low back or low seating arrangement helps keep the openess effect. If you want to merge the two areas then consider one consistent colour scheme. No doubt greens will be the easiest colour to match against but consider the other colours. You wouldnt want to have colours clashing. General natural browns and beiges with whites make the easiest effect on the eye. Garden lights outdoors can be a real plus late in the evening. Again it will help make the garden attractive and help extend the indoors out a lot further. Consider low energy options where possible. Keep the garden uptogether. You want the garden to be attractive enough to make friends and visiotrs want to look out onto. If its full of burnt out cars and shopping trolleys then you really are missing an obvious trick. We hope this will prove helpful in your quest for an enjoyable summer feel throughout the year. I just wanted to make you aware that you are using our Bi Fold Doors image Above. Although we are happy for you to use this image, please either make it evident that we are the manufacturer of this product or put a link on to it taking customers directly to us.